Another weekend, so it’s off to the flea market again. It was a good day. I brought home six tools for $6. The ratchets don’t work and the other stuff is rusty. (If this doesn’t seem like a good deal to you, I assure it is.) 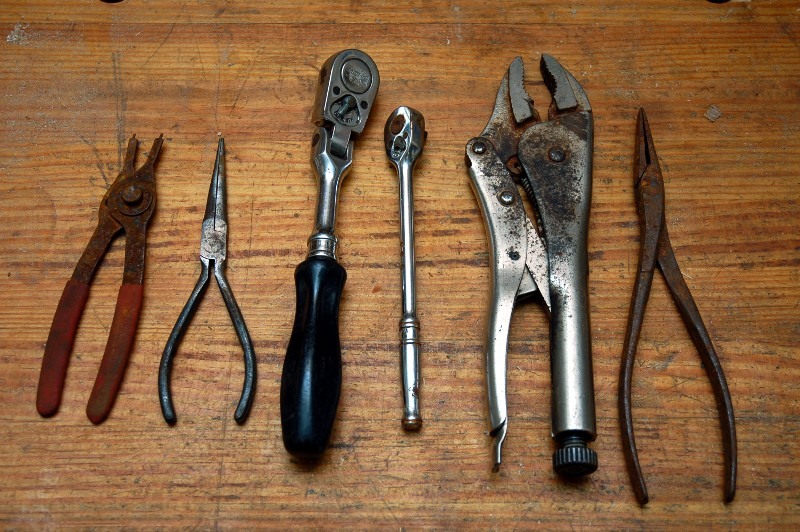 The pliers on the right are pretty neat. They’re Utica brand and have a very thin nose and profile to it. No brand on the small needle nose. It looks like it might have had padded handles at some point with the brand on them. 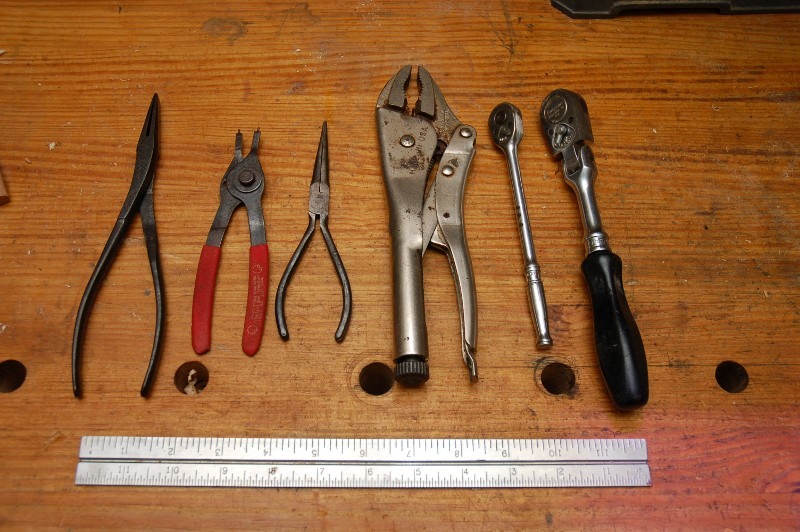 The retaining ring pliers on the left are no-name Chinese made and have seen better days. The 3/8″ drive flex ratchet is a Snap-On F735B made in 1992. The direction selector was hard to move and it barely ratcheted. The flex head had no friction in it and flopped around. The 1/4″ drive ratchet is a TML70A made in 1994. The selector and drive were frozen and could not be moved by hand. Sounds like good candidates for a rebuild. 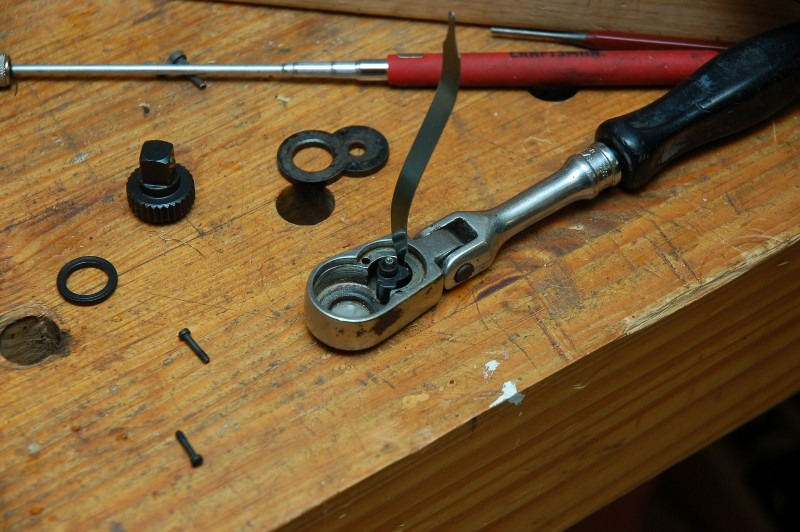 The first step in disassembling the ratchets is to remove the screws. On these ratchets the screws are slotted. If the screws are covered in gunk you’ll need to scrape it out of the way first. 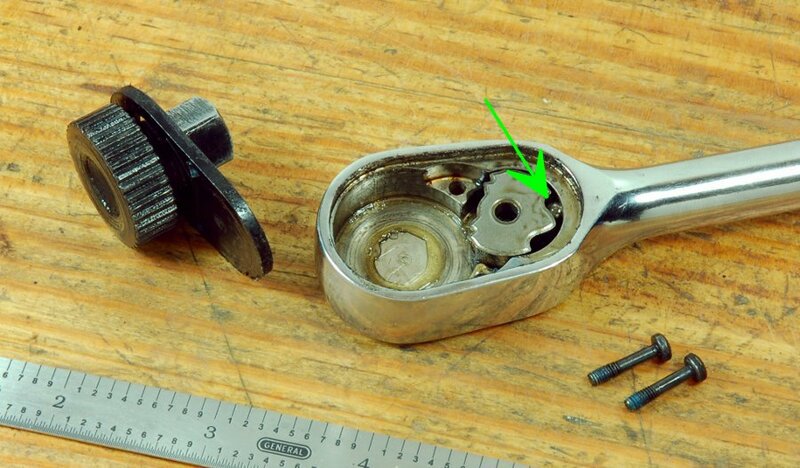 Next, find some way to hold the ratchet fixed so you can focus on removing the screws. You really don’t want to strip these. Next, the bottom plates need to come off. Normally, they just come apart pretty easily. When they’re all rusty…not so much. I shot them with some PB Blaster to see if it would loosen them up enough to come apart. Unfortunately, this didn’t work. The gear is flush with the top of the body on the 1/4 drive ratchet. As such, it can be tapped a couple of times with a punch to encourage the plate to come loose. 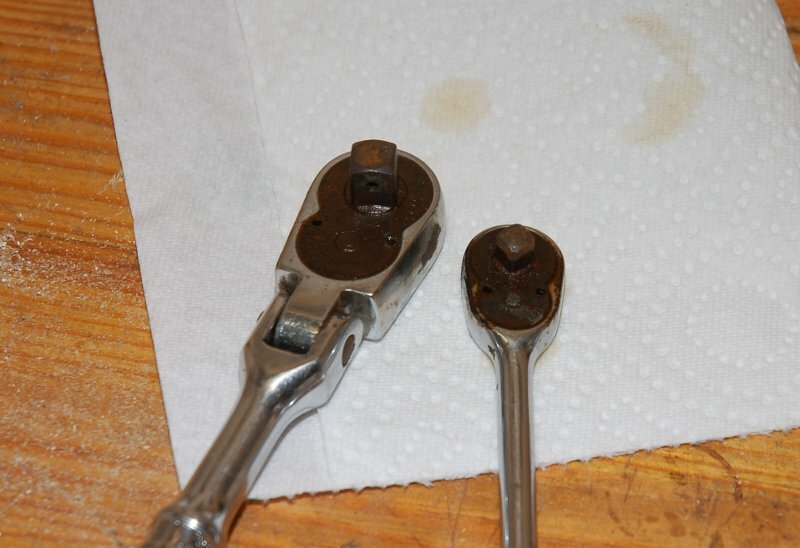 As you can see, the inside of the ratchet was pretty wet and rusty. The 3/8″ drive was also wet and rusty on the inside. Apparently the previous owner liked leaving his tools out in the rain or something. 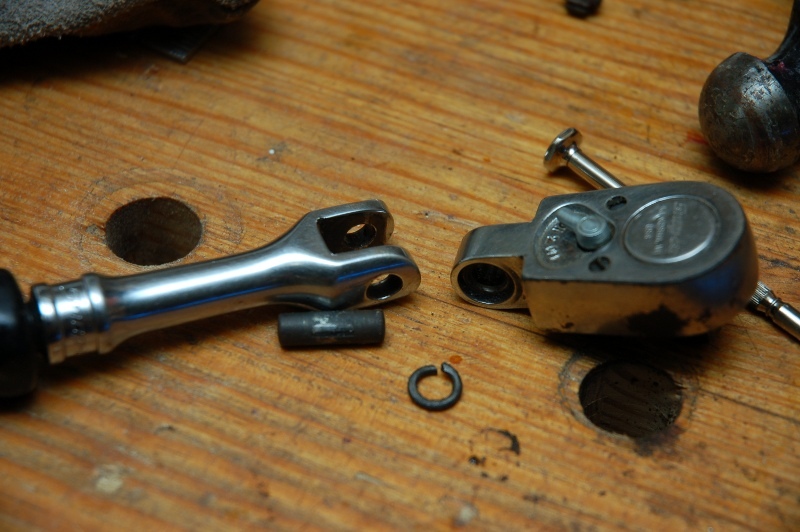 Another approach had to be used on the 3/8″ ratchet. I angled a pin punch through the screw hole and lightly tapped on it. This was enough to make the bottom plate pop off. With the plate out of the way the gear and pawl can be seen. The gear can be removed by puling it up. On these models, the pawl is staked into place by a pin that runs through the selector switch and into the pawl. This pin must be driven out from the bottom of the ratchet to remove the selector switch and pawl. Once the pin is removed, the pawl can now be removed. Beware though! There is a spring loaded ball bearing hiding between the pawl and the body. If you carelessly remove the pawl the spring will launch the ball and itself off to never never land. You’ll then get to spend a while looking for them. The picture from below isn’t from either of the ratchets above but it is a Snap-On and shows the spring loaded ball bearing. I didn’t get a good picture of the ones I had to show this point. Here’s what the pin looked like on the 3/8″ drive ratchet. I bet this explains why the selector switch was so tough to move. Here’s a picture of all of the ratchet guts plus an extra selector switch and pin. With the ratchet fully disassembled it is time to clean. I used a combination of the ultrasonic cleaner and some scrubbing. Now it is time to reassemble the ratchet. Snap-On sells the wavy little tool shown in the picture below for helping put the ball bearing back in place. 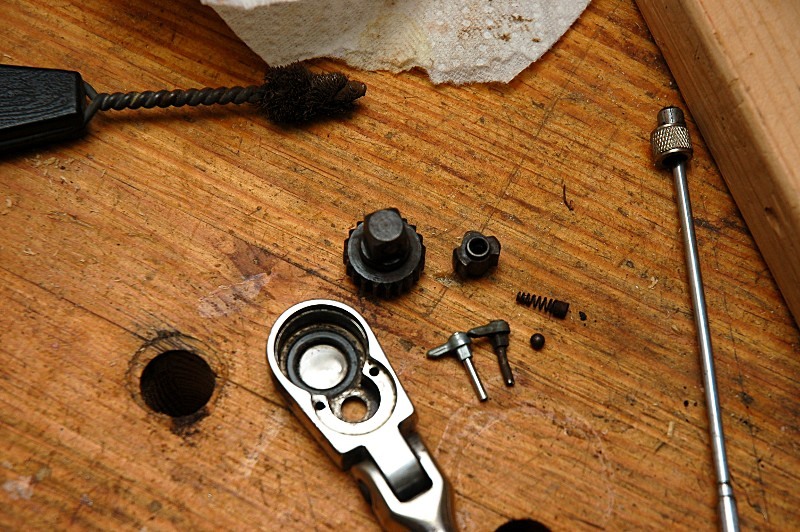 You insert the spring into a hole and the ball bearing rides on the end of it. The trick is compressing both into the body so you can slide the pawl back in place. This tool has a depression in each end with a hole drilled in them for the ball bearing to sit in. You can, of course, make something similar to this as opposed to buying it. Without this tool or a homemade one you’re left with trying to press the ball in with a screwdriver. Good luck with that on the 3/8″ drive. For reasons I don’t recall, I had a Snap-On RKRAFN720 rebuild kit laying around. I’ve read before that older ratchets that had a 20 tooth gear can be upgraded to 30 teeth with newer rebuild kits. It turned out that this kit fit my ratchet perfectly. The extra teeth mean that there are now 12 degrees between each click instead of 18 degrees. It doesn’t seem like much but makes a world of difference when you’re in a tight space. For reference, newer ratchets are up to 80 to 100 teeth for even smaller angles. Here’s a picture of the 20 tooth gear on the left and the 30 tooth on the right. 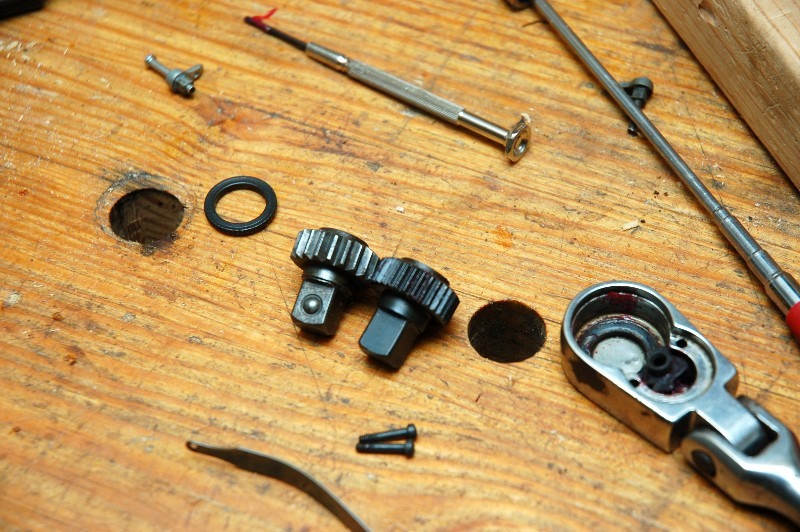 To complete the reassembly, dab some grease between the ball bearing and pawl with a toothpick and lightly grease the gear. Then drop the gear back in and put the cover back on with the screws. The other problem this ratchet had was a floppy head. To troubleshoot this I pressed the pin out with my Dake arbor press. 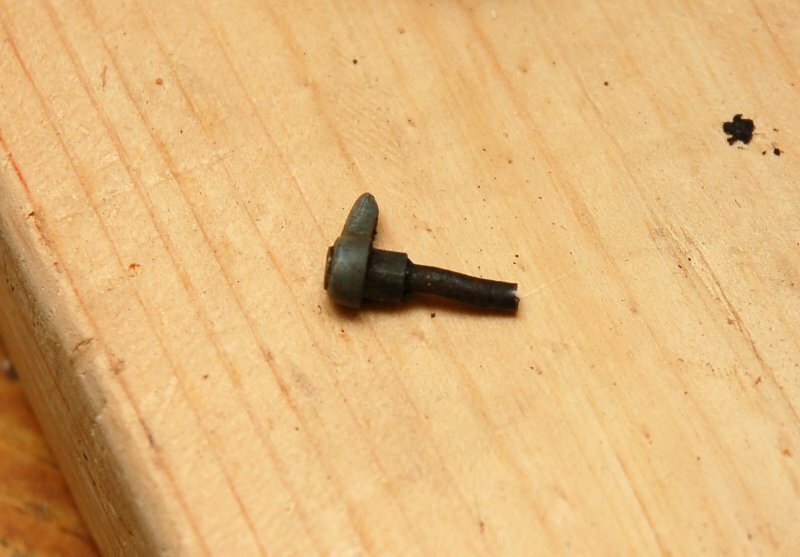 1/4″ bolts work well for pressing the pin out with the press. 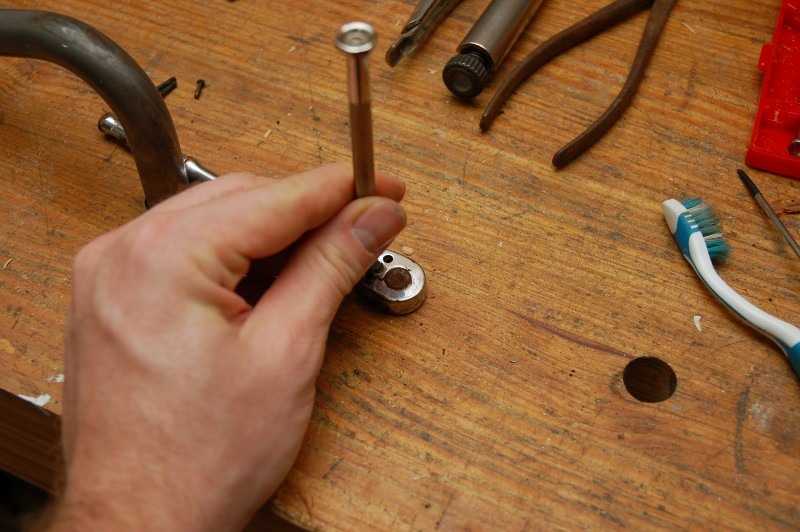 A hex nut was used to hold the ratchet up off the press’ platen so the pin could move down. It turns out that Snap-On uses a split washer to create friction between the handle and the head. The end of the washer had worn flat on top so that it didn’t work correctly. I flipped it over and solved the problem. The pin was pressed back in and the ratchet was good to go. I tried it out on the car today and it worked great. The 1/4″ drive ratchet is designed exactly like the bigger drives. It’s just smaller. Much smaller. Take a look at this picture below. The ball and pawl on top are from the 3/8″ drive ratchet. 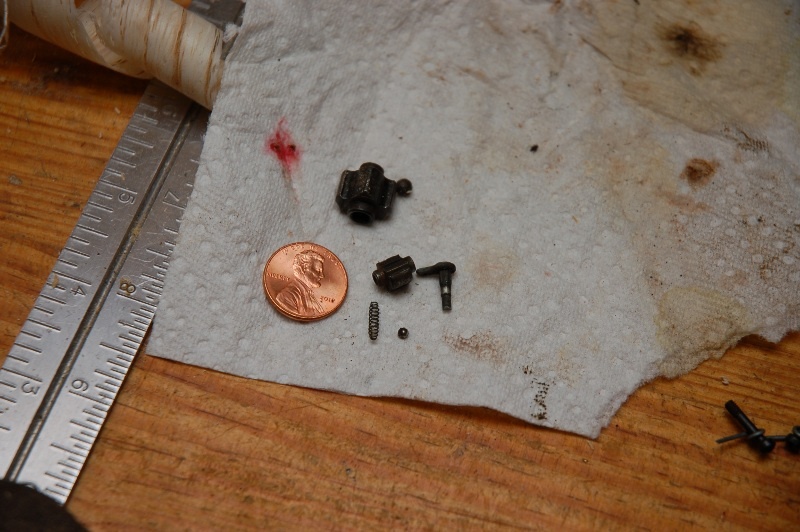 The parts below are from the 1/4″ drive version. There’s a penny and ruler in the picture for scale. If you’ve ever had fun compressing the ball bearing and spring on a larger ratchet, doing it on a 1/4″ drive is about 10 times tougher. The first thing to do is pray for divine guidance. You’re going to need it once the tiny parts shoot out. I managed to shoot the spring out a couple times and had to spend time tracking it down. I…uh…misplaced the ball bearing as well a few times. 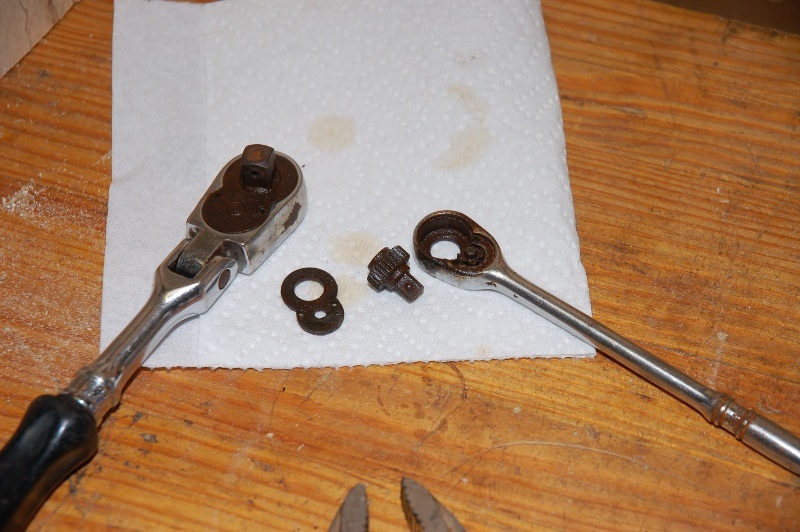 I highly recommend you find some place contained and clean to reassemble the smaller ratchets. It finally occurred to me to dab some grease on the end of the wavy tool to hold the ball bearing on the tool. This made things easier and allowed me to finally get it back in. 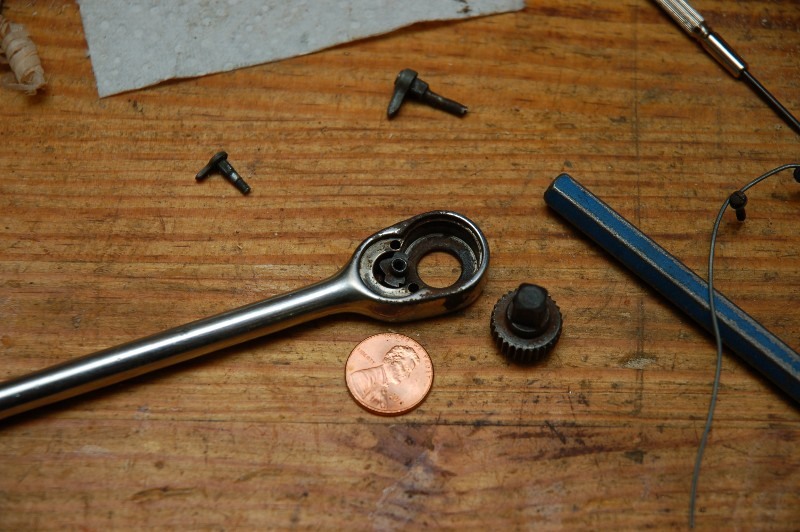 Here’s a picture of the ratchet and parts with the penny again for scale. All of the parts in this ratchet were in pretty good condition though the gear could have used replacing. I cleaned all the rust and gunk out of it before reassembly and it seems to be working well. I tried it out and it functioned properly. With the ratchets fixed, I turned my attention to the other tools. I didn’t do much to the locking pliers except for oiling them. The other pliers got tossed in the ultrasonic cleaner but it didn’t do anything against the rust as I expected. So, I pulled the padded grips off the retaining ring pliers and gently wire wheeled all three pliers. After that everything was wiped down with a light coating of oil and I oiled all the pivot points. Compare the pic below with the first one. Now all of it works well and looks pretty good too. I need to find some 1/2″ drive ratchets to rebuild next for parity. 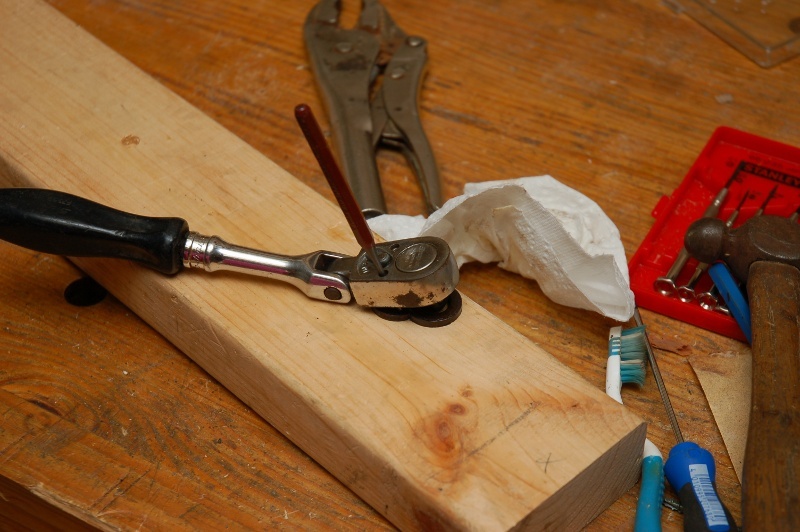 This entry was posted in Restoration, Tools and tagged ratchets, restoration, Snap-On. Bookmark the permalink. Thanks for your help. I was able to get the spring and ball in on a 1/4 inch drive using a piece of dental floss. I tied one end to the handle and up through the hole in the back, spread it out over the ball (now part of the spring and not a separate part) and pulled and pushed with a small screw drive to get it all into the hole. Then I was able to seat the pawl (smaller black piece). Be sure to put it right side down. One hole is squared off. Took me a while but I got the SOB. Just to clarify the above, it was Glide dental floss, the kind that is flat. I can’t imagine ordinary round floss working at all but didn’t want anyone to misundersand what I did. Also, I recommend working with some kind of shield, I used a box on it’s side because before I did that I lost the spring when it shot out. I spent about an hour looking for it and then called snap on for a replacement kit which is in the mail (free). I found it several hours later almost by accident. As you can see from the photos the spring is really small.